Pioneer Corporation is a Japanese multinational corporation based in Kawasaki, Kanagawa, Japan. The company was founded by Nozomu Matsumoto in 1938 in Tokyo as a radio and speaker repair shop. 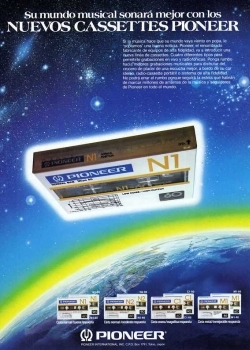 In 1966, Pioneer establishes sales companies in Europe and the U.S.
Pioneer cassettes for US market are rebranded FUJI cassettes. Pioneer cassettes for South American market are rebranded DENON cassettes.